Google has officially launched the missing piece in Google’s online office suite: Presently, a presentation product that competes directly with Microsoft PowerPoint. We’ve know it’s been coming for a long time, the PowerPoint competitor was first rumored in February then confirmed by Google CEO Eric Schmidt in April. 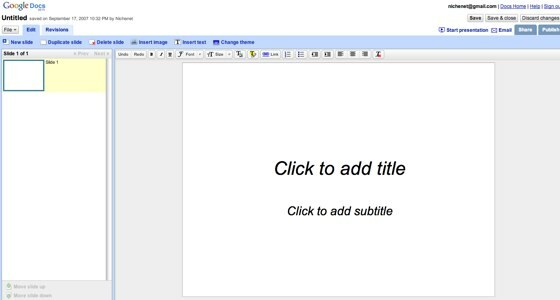 More recently Google integrated PowerPoint viewing functionality into Gmail. and last week we posted on reports that it would be launched “within days.” I didn’t know it at the time, but the official launch is TechCrunch 40 but the site is live now. First impressions: it depends on what you like when interacting with Office packages. I’ve become a big fan of Google Office products due to their simplicity and most importantly their online collaboration features. I’ve complete abandoned using Microsoft Office altogether, but I do have NeoOffice installed for offline usage (mostly when flying). Presently doesn’t have all the bells and whistles PowerPoint has, but that’s in part the appeal. Anyone who has used the Microsoft Office 2007 ribbon is able to explain their frustration at what at first is a bizarre interface that takes a fair bit of learning. Presently, like Docs and Spreadsheets before it is straight to the point. Is Presently the Microsoft killer many are hoping it will be? Perhaps not yet, because Google still has work to do in breaking into the corporate marketplace, which we know they are doing with their Capgemini deal. For the rest of us, for all bar perhaps intensive presentations, Presently makes a great PowerPoint compatible tool, and at $0 it comes at the best price of all: free. As of now, Google has also renamed Google Docs and Spreedsheets to simply Google Docs.